The National Agency for Food and Drug Administration and Control (NAFDAC) has been notified of falsified versions of ICLUSIG 15mg and ICLUSIG 45mg circulating in the WHO Region of Europe and the WHO Region of the Americas. 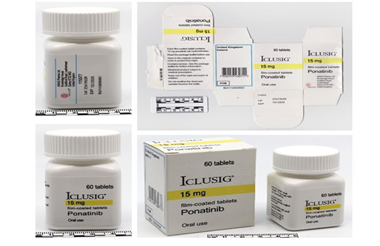 The active pharmaceutical ingredient of the Genuine ICLUSIG is Ponatinib Hydrochloride, which is used to treat different forms of leukaemia. Laboratory analysis of ICLUSIG 15mg with batch number 25A19E09 has confirmed that the product does not contain Ponatinib and instead contains paracetamol. 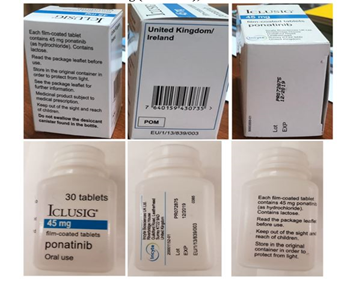 Laboratory analysis of ICLUSIG 45mg with batch number PR072875 has confirmed that the product does not contain Ponatinib and instead contains paracetamol. ▪ The above batch numbers do not correspond to genuine manufacturing records. NAFDAC advices wholesaler, distributor, and pharmacies that product should be obtained from authentic and reliable sources, increased vigilance is hereby encouraged within the supply chain to avoid infiltration of the falsified product. NAFDAC implores healthcare providers to ensure vigilance to prevent the administration of the falsified products to unsuspecting patient. Health care providers and the general public should notify the nearest NAFDAC office of any information concerning the distribution, sale, and use of the falsified two versions of ICLUSIG products.